Yesterday Dr. Bronner's Magic Soaps announced that it had acquired Sun Dog Hemp Bodycare in a Business Wire press release that was also available at Yahoo Financial News. Last year Dr. Bronner's announced that it had acquired Gertrude & Bronner's Magic Alpsnack and added five new flavors of this delicious snack bar to its lineup. Showing the usual Bronner family attention to detail the new product line will be available for sampling at the Natural Products Expo West 2005 in Anaheim Convention Center in Anaheim, CA March 17-20. Dr. Bronner's & Sun Dog's Magic lotions and balms are now available to distributors and stores, as well as direct to consumers through the company's web site. 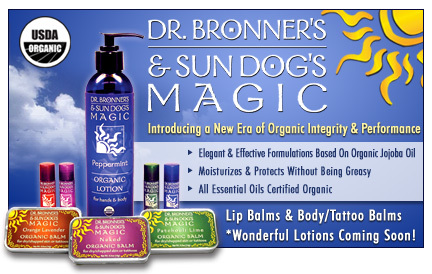 Developed by Cosmic Egg Studios of Boston the new Dr. Bronner's & Sun Dog's Magic web site is a visual delight. Look for more merger news in the next few years as the hemp industry grows and matures. 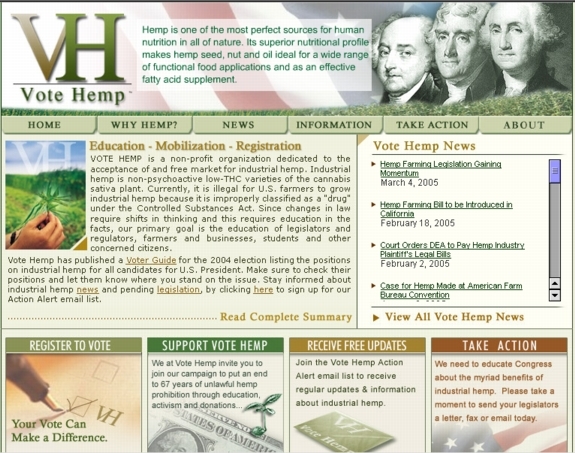 After months of behind the scenes work by Cosmic Egg Studios and the Vote Hemp Board Vote Hemp has a new web site. Vote Hemp is a non-profit organization dedicated to the acceptance of and free market for industrial hemp and to changes in current law to allow U.S. farmers to grow low THC industrial hemp. The latest press release from Vote Hemp is Hemp Farming Legislation Gaining Momentum talks about legislation that has been introduced in California, New Hampshire, North Dakota, and Oregon. There is also a statement in the press release hinting at hemp legislation on the federal level in the U.S. as well. 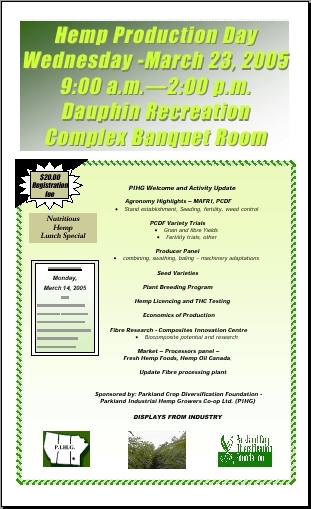 March 23, 2005: Hemp Production Day, 9:00 am—2:00 pm, Dauphin Recreation Complex Banquet Room, Dauphin, Manitoba, Canada. Please pre-register by March 14, 2005. Please click here to download the PDF flyer. Sponsored by the Parkland Crop Diversification Foundation. Web site: http://www.pihg.net, email: pihg@mts.net, phone: 204-629-4367.